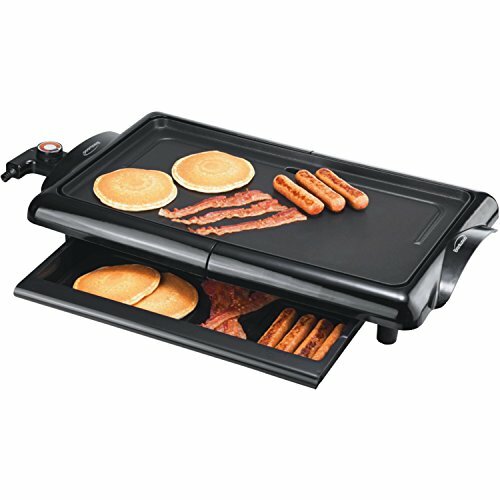 Serve the family with this handy 1,400-watt Electric Griddle from Bentwood® Appliances. Its large, die-cast aluminum cooking surface area with its nonstick coating makes it easy to cook multiple items at once as well as clean up. Keep what you've just cooked warm in the convenient warming drawer as you work on the next batch. The temperature control is adjustable for greater control. An LED power indicator light never leaves you in doubt as to whether the unit is turned on. The handles remain cool to the touch, the drip tray is under the griddle and many parts are dishwasher-safe. Weight: 8lbs. Dim: 3.5"H x 14"W x 5.25"D.